Here's a list of the foes you will face. Alpha Crawler - More dangerous than the standard variety, the Alpha leads packs of Crawlers into battle. Luckily, Alphas can be identified by the series of Hardlight spikes along their head and back. this unit uses Supressors as a ranged weapon. Crawler - The most common Prometheans on Requiem are the Crawlers. Crawlers are extremely agile and move in packs. The can swarm an enemy and tear them to pieces, or utilize a Boltshot from a distance. Crawler Sniper - A long range variety of the Crawler. Knight - The captains of the Promethean force, the autonomous and intelligent Knights are ancient warriros tasked with defending the artificial world called Requiem. An encounter with a single Knight can turn deadly, as they systematically bring more enemies into the fight. Knights wield weapons like the Supressor and LightRifle. Knight Lancer - Utilized primarily as scouts and marksmen, Lancers are extremely accurate even at a great distance. Among their many skills, Lancers utilize Promethean Vision to track targets even when they're behind solid objects. 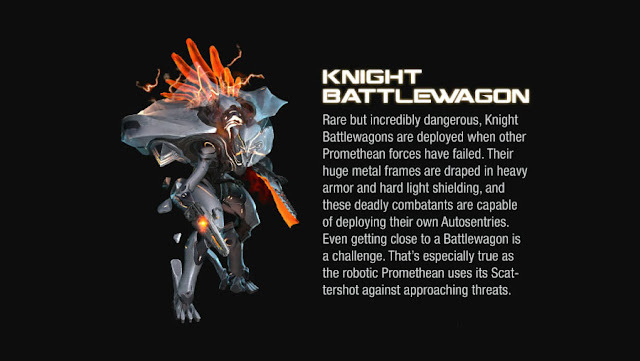 Knight Battle Wagon - Rare but incredibly dangerous, Knight Battlewagons are deployed when other Promethean forces have failed. Their huge metal frames are draped in heavy armor and hard light shielding, and these deadly combatants are capable of deploying their own Autosentries. Even getting close to a Battlewagon is a challenge. That's especially true as the robotic Promethean uses its Scattershot against approaching threats. Knight Commander - As the name suggests, Knight Commanders lead groups of Knights. Commanders have the formidable combat skills of a normal Knight, and can also wield Incineration Cannons, don stronger armor, and deploy floating Autosentry turrets. Watcher - These flying robotic creatures emerge from the armored shell of Knights. 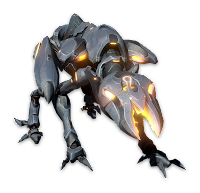 Once active, they can resurrect Knights, summon Crawlers from the bowels of Requiem, create shields to protect other Prometheans, or attack using their most common armament, a Boltshot.